2015 is shaping up to be the biggest year for new condominium developments since 2007. At least 6,500 new condo units are expected to open below 96th street, the New York Times reported. New York is not alone, as cities like Miami experiencing their own luxury condo surge. DeSimone Consulting Engineers has risen to meet this boom embarking on a series of notable residential projects including: Vornado Realty Trust’s 950-foot building at 220 Central Park South, designed by Robert A. M. Stern Architects and SLCE Architects, with interiors by the Office of Thierry W. Despont; 50 West by Helmut Jahn and SLCE Architects; 100 East 53rd Street designed with Foster+Partners and SLCE Architects; and 1000 Museum in Miami designed by Zaha Hadid. In the changing market, competition is fiercer than ever. The starchitects of these revolutionary projects require innovative engineers to bring their unique designs to fruition. With impressive details in design, each building offers a distinct style, and with it, special engineering challenges. 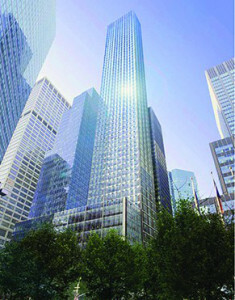 220 Central Park South will be a new luxury residential condominium building in Manhattan totaling 430,000 square feet. The 950-foot, cast-in-place concrete tower will offer unobstructed views of Central Park. 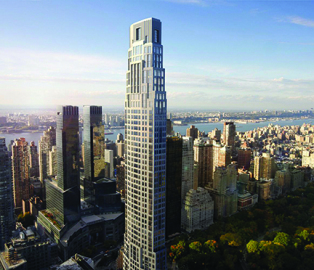 Luxury is everything and in order to accommodate all of the expected amenities within this supertall structure, DeSimone Engineers, along with Stern Architects and SLCE Architects, faced unique challenges. 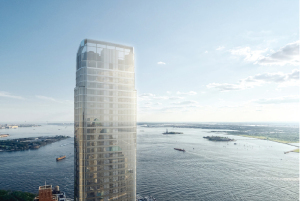 50 West, at 780 feet, is expected to be one of the tallest residential buildings in Manhattan. Located at 50 West Street between Joseph P. Ward and Rector Streets in Lower Manhattan, the tower is expected to be approximately 500,000 gross square feet (GSF), containing 335,000 net square feet (NSF) of residential space and a 30,000-square-foot commercial podium. The building is expected to have 11’-0” floor-to-floor heights and floor plates of approximately 7,500 square feet (SF). Unique challenges: Supertall, small footprint, and varying ceiling heights. The luxury building includes 280 residential units, 155 hospitality guest rooms, two levels of parking, lobby amenity areas, and LEED certification. “Creating this building within such a small footprint was especially challenging,” said Mukesh Parikh, Associate Principal. The supertall, LEED certified project utilized tuned mass dampers for movement control, and a concrete crown was used to cut costs. “At the top, the building has a very beautiful crown, we had designed it as steel framing, but then when we did the pricing and the cost was very high, so we came up with the concrete option.” he said. 100 East 53rd Street stands poised to rise into midtown Manhattan skyline opposite of the Citigroup Center at 53rd and Lexington. 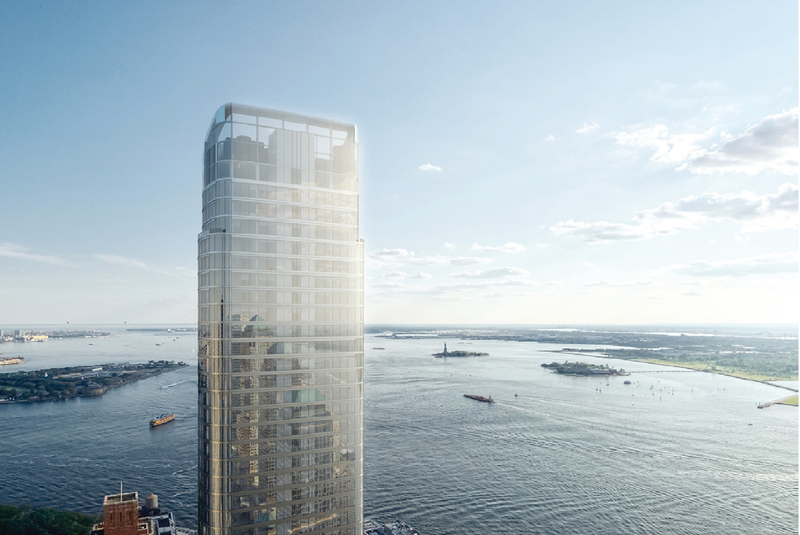 With a height of 715 feet and a footprint of only 4,000 SF, this slender tower will provide 61 stories of luxury condominiums and stunning amenities. The façade, designed by Foster and Partners, is a delicately faceted curtain wall that captures the reflections of the city and compliments the nearby Seagram Building. Working along with SCLE as the Architect of Record, DeSimone has designed a structure that mirrors the faceted exterior, blending in with the aesthetic of what Foster describes as a “vertical blade”. Unique Challenges: Tall and thin. Limited to a 4,000 SF tower footprint, the building will rise 715 feet, giving the structure a very slender aspect ratio of 16.5:1. To overcome this challenge, the structure primarily consists of a rigid central core with only eight perimeter columns in the tower. Belt trusses at the two intermediate mechanical floors and a hat truss at the roof help control the building’s lateral movements. In addition, a two-story rigid link is located at the top podium level, reducing the effective cantilever length of the tower. Tuned dampers are utilized to control the building’s lateral response. “Space is at a premium within this building, and designing a structure that could not only fit within the constraints, but also compliment the building’s shape was key to allowing the full potential of the architectural design.” Said Jarret Johnson, Associate Principal. One Thousand Museum, designed by Pritzker-Prize winning architect Zaha Hadid, will create an approximately 709 foot tall, 62-story residential tower along the Biscayne Bay waterfront. 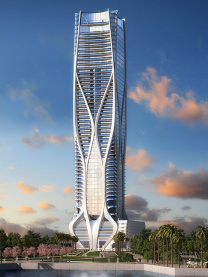 The 1.3-million-square-foot project is Hadid’s first skyscraper in the Western Hemisphere. The eight-story podium will house ground-level retail, parking, and an amenity deck on the top level. The tower will contain a mix of duplex, half and full floor units, residential amenities, a rooftop helicopter pad, and a private lounge. Unique challenges: An aesthetic, sculpted, exoskeleton which as a lateral load resisting system. The lateral load resisting system of the tower will be comprised of a concrete shear wall core working in tandem with a sculpted reinforced concrete exoskeleton. DeSimone engineers came up with this solution after seeing the initial plans for the sculpted exterior. At the base of the building the exoskeleton begins with massive carved legs firmly anchoring the building and gracefully embracing the slab edges as they taper in the upper elevations. The gravity load resisting system will utilize concrete post-tensioned slabs. The architectural requirements for minimal interior columns have resulted in typical floor spans in excess of 40 feet. The upper floors appear to be suspended from the exoskeleton at each corner of the building. This is achieved by supporting 30-inch thick full-height reinforced concrete curved brackets off of the exoskeleton columns at each floor allowing for large cantilevers of 25 feet.